We are able to offer high quality business card printing in full colour at very competitive rates, employing the latest lithography and digital printing techniques. We print them on thick board to ensure they convey quality and professionalism and have been printing business cards for companies throughout the UK for over 10 years with customers returning again and again for our creative designs. 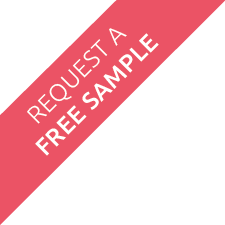 Our free sample pack includes a variety of business card samples so you can get a feel for the cards before you buy. A selection of creative business card designs by Face Media Group. Ordering can be somewhat confusing; with many different sizes, styles, and various types of material, it is sometimes difficult to know where to start. This section gives clear concise explanations on all ranges to help you make an informed choice. What is 3 + ten? Not recommended for writing on as pen doesn't take well to laminate. I recently ordered some Laminated Business cards and I would just like to thank Facemediagroup.co.uk for printing the most excellent, high quality product we could have imagined! If you require a testimonial, You've got one! We look forward to asking you to print our future merchandise including many hundreds of business cards, envelopes, A5 flyers and DL folded leaflets.We wish you as Merry a Christmas as you have made ours! I was very pleased with how my laminated business cards turned out. I have been very impressed with the high standard and quality of the jobs you do, and have given your details to friends of mine who are thinking of using you as well. By the way, I love the website. Anyway, onto business. I have attached the images I need for my next job; mini promotion plus. Let me know if the images are good enough. Face Media Group are much more than a flyer-by-night operation; they are letterhead and shoulders above the rest. They are in the business of making business… cards. Easy online ordering, quality print, fast turnaround and super competitive prices are proof alone that they are leaders in business & commercial printing. Yes. We have been designing business cards for 10 years and have our finger on the design pulse. We are comfortable designing unique and creative cards for all industries and know what works best on what stock. We also offer competitive prices on our design charges. Are there any alternatives if I want to order a large quantity? If you need a large quantity of cards, that are more generic than a specific person's business card, or you want to use them as loyalty cards, then we would suggest you consider our mini marketing cards. What are the dimensions of a business card? In the UK, the standard size is 85mm x 55mm. However, there is actually no global business card printing standard. You can find out more about international business card sizes on Wikipedia. How should I prepare my artwork? When supplying artwork we need a 2mm bleed on each edge. 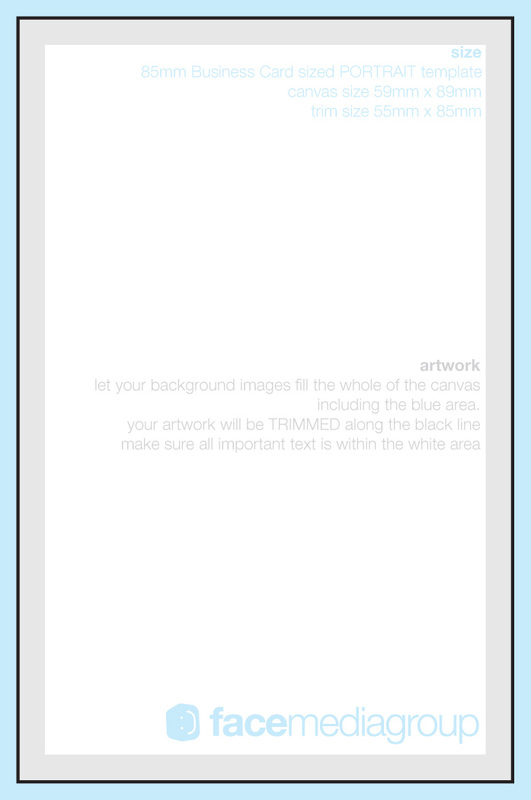 Therefore the canvas size of the artwork should measure 89mm x 59mm. 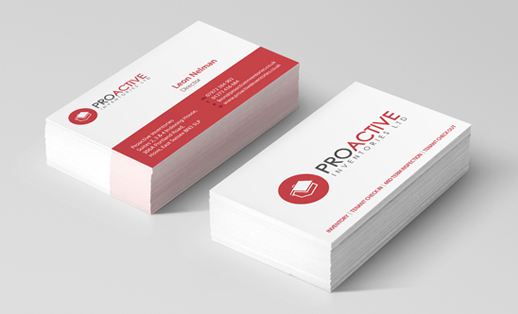 Yes, we have a variety of free business cards design templates available for download. What's the difference between Digital cards, and Lithographic business cards? Digitally printed cards are the most economical for small batches. They are also perfect for larger companies (where there's a substantial turnaround of staff) or new starters. With digital cards, you can kit out a new starter at a very reasonable price, helping to make them part of the team, without investing a substantial amount of money in their cards. The digital cards are perfect for simple card designs, lots of white space, a logo, some text (not grey*). Our litho business cards would be more suited to cards carrying lots of colour, photo's etc - PHOTOGRAPHERS NOTE - choose our stochastic 400gsm silk cards for best results. Should I have single or double sided cards? In some cases, a single sided business card may not be sufficient, when simultaneous promotion of your website and/or services is also necessary. A double sided business card provides the perfect solution. What special finishing is available? There are number of options available to add a touch of class to your business cards. There's uncoated stock, silk board or even matt laminate which gives the cards a soft rubberised feel and a protective layer. When you order either our low cost cards or laminated business cards, they will arrive with you, in our specially made presentation boxes, with a FREE clear business card wallet included. How important is a business card? It is often the first thing a potential customer will receive from you, it helps your company purvey professionalism and is retained as a reference by its recipient. This makes it one of the most important printed items you will ever purchase. It is the business suit of the print world. No matter the industry it is important it shows commitment, quality and durability. Your business card is a direct reflection of you and your company. Arming yourself with a quality looking business card is paramount for giving the best impression in the business world. This template will ensure that you won't be left unprepared, allowing you to let your business thrive. Pass them on to prospective clients, customers, anyone you can think of who would benefit from having your details to hand. Despite the advances in modern technology, a business card is still one of the most important marketing tools a company can use. They are a key element to making a good first impression and can help build strength and trust in your brand. 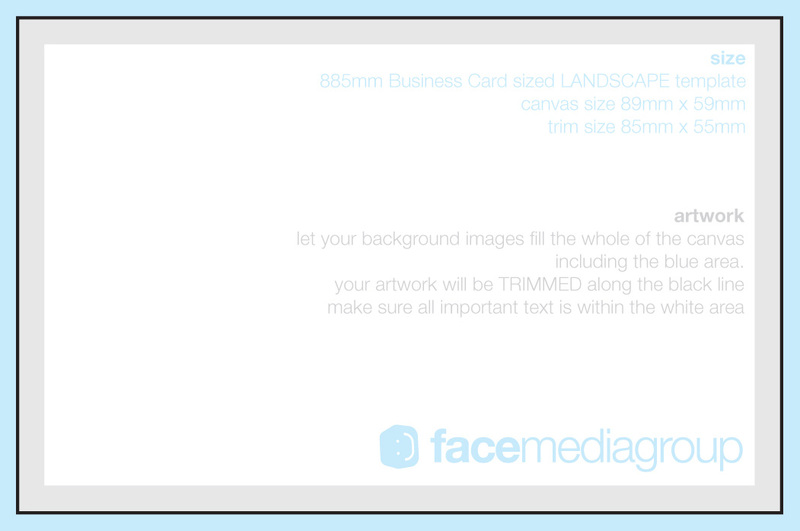 To ensure you start with the correct tools, download one of our blank business card templates. Some paper stocks lend themselves better to designs than others. Thin, grey text printed digitally, for example, can appear mottled and illegible, so make sure you use a strong colour and font that's not too thin to ensure a digitally printed card is as clear in the finished print as it is on your computer monitor. Don't fill the design with too many logos, accreditations and associated brands. Yes, it's great to shout about that certification you've just been awarded, but leave that for your website and social network pages. By stripping back the logos and supporting imagery you include on the card, you leave more room for relief space which is key to making your card look less cluttered and more professional. QR codes can be a good way of condensing a lot of information down and showing it to one place. You can direct people to a downloadable vCard that includes your name, email and phone number, but make sure if you are sending a user to a website, that it has been made mobile friendly to ensure the experience carries on through to your website. Try not to use more than three typefaces and a simple colour palette, making sure you keep in line with your brand identity. This will establish trust in your business and make your company instantly recognisable. Never let your font size go below 7pt to ensure it is legible and leave lots of space around the edges to keep the design look clean. Remember, that layout you've used may look great at 400% on your computer monitor, but how will it present itself once the card is printed? Keep it simple. Don’t over complicate your design think about the message you’re trying to get across. Your business card isn’t a flyer or a brochure; it doesn’t need to sell your company, it needs to serve as a reminder. So get straight to the point, say who you are, what you do, and how to get in touch with you. This is a must. We are all human and so are all capable of making mistakes. The last thing you need is 100 business cards with the wrong contact number or misspelt email address. So READ, RE READ and then READ it again. Just in case. Double check the technical specification. We like our artwork supplied Print Ready. So make sure you have supplied your artwork in CMYK, 300dpi with a 2mm bleed to each edge.